Our first film projection for this new year will be “12 Angry Men“, a movie released in 1957, directed by Sidney Lumet and staring Henry Fonda. It will take place on Tuesday January, 27th at 17h45 in UQAM Psychology department (in Montreal), room SU-1550. This will be our 5th conference about Cinema and Phenomenology. The film will be introduced by Florian Ibarruthy, PhD/PsyD student with Mr Christian Thiboutot. It will then be followed by a discussion, to which everybody present will be invited to participate. 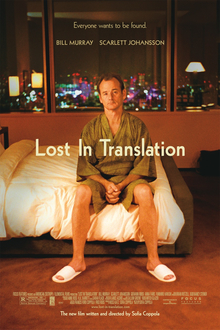 Don’t miss the projection of “Lost in Translation“, on Thursday November, 20th at 17h45 in UQAM Psychology department (in Montreal), room SU-1550. This will be our third conference about Cinema and Phenomenology. Our theme this month is about existence, modernity and strangeness. We have the honour this month to welcome Jacques Quintin, professor at the University of Sherbrooke, who will introduce the film. It will then be followed by a discussion, to which everybody present will be invited to participate.